Tooth loss or extraction leaves a space between teeth that may cause problems if allowed to remain. When teeth are removed, the supporting bone tissue shrinks over time. Resorption of the alveolar bone that supports teeth begins almost immediately after extraction. If you lose multiple teeth, significant bone loss may occur, and this can affect your appearance and your ability to wear dentures. Other problems related to tooth loss include drifting of your other teeth and an increased risk of tooth decay and gum disease. Fortunately, if you’re missing one or more teeth, you may have several options for tooth replacement. One of the most popular and desirable replacements for a single lost tooth is a dental implant. 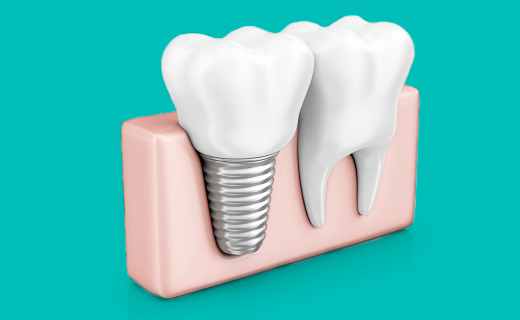 A single implant procedure involves placing a metal post into the jaw to serve as an anchor for a natural-looking artificial crown. Benefits offered by a dental implant include strength, stability, increased longevity, and predictable results. If you have enough healthy teeth to support one, a fixed bridge is another possible option. A bridge uses adjacent teeth to support a prosthetic tooth or teeth suspended between them. An implant-supported or traditional partial denture is also a potential solution. Multiple teeth can be replaced by several single implants, implant-fixed partial dentures, conventional fixed partial dentures, or removable partial dentures. For a dental implant to be successful, you must have enough healthy gum tissue and underlying bone to support it. If you don’t, your dentist in Virginia may be able to solve the problem with bone grafts and other treatments. Conventional and implant bridges can increase your risk of cavities and oral infections if strict oral hygiene is not maintained. Dentures that replace multiple teeth may be uncomfortable or temporarily decrease your sense of taste. Your tooth replacement options depend on many factors including the length of time that has passed since the loss of your teeth and your general oral health. To learn more, visit an affordable, qualified dentist in Virginia for functional and aesthetic restorations. Very nice staff. The Dr is great. Dr Lin is thorough and very informative. Staff are helpful and sovle the problems. Staff was very friendly and courteous. My dentition was efficient and competent. I was very pleased with my visit.